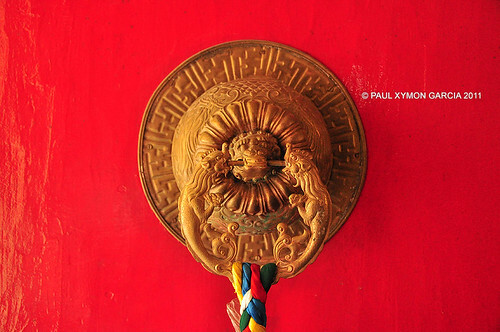 Paul Xymon Garcia, a language lover, travel writer and photographer shares how he unwittingly follows in the footsteps of BBC television presenter Michael Palin with serendipitous twists and turns from India to Nepal. To say that my travels have been inspired by Michael Palin’s Himalaya would be a bit of a stretch. I did see the four-part BBC series and eventually read his memoir that came with it, and I have been somehow following his journey in parts since October last year. However, most of it, heck, all of it, was purely and absolutely incidental. December 2010 was when we bought those one way tickets to India. A friend and I had been toying with the idea of long-term travel—backpacking, if you will—for about some time then. I didn’t want to admit it until I had to. When I had to, I felt I had made the right decision. I was going backpacking for six months through India, Nepal, Southeast Asia and China. We planned our routes, planned them day and night, planned them til the cows came home. Little did we know that when you’re traveling for such an extended period of time, plans rarely go as you imagine them to be. We touchdown in India, intent on seeing the Thar desert, our first real desert experience, in Jaisalmer, Rajasthan. We were so intent on getting our Arabian Nights on that we booked our train tickets there three months beforehand. The travel gods had other plans, however. So we missed our train. Yes, the one time we arrived late was the one time the Indian transportation system was on time. 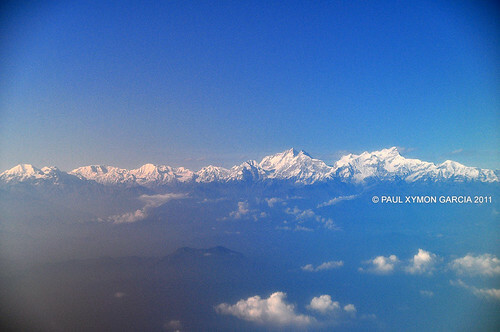 We talked about contingency plans until we agreed on a place in India’s Himalayan province up north—Dharamsala. That was the first time we were to step on Mr. Palin’s footsteps. After our 14-hour bus ride up on precarious mountain slopes and dusty roads, we had arrived, in a township called McLeod Ganj. We had wanted to come here because this is a part of India that was completely different from the rest of it. It’s not Hindu, nor Muslim. Fearing persecution from Chairman Mao’s Cultural Revolution, the Dalai Lama flees in the dead of the night to India and settles in here, in the Himalayan foothills of McLeod Ganj. 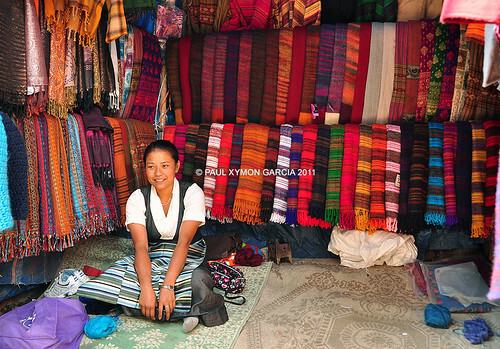 Ever since then, Tibetans from the old country have made the cold, dangerous pilgrimage there, too. 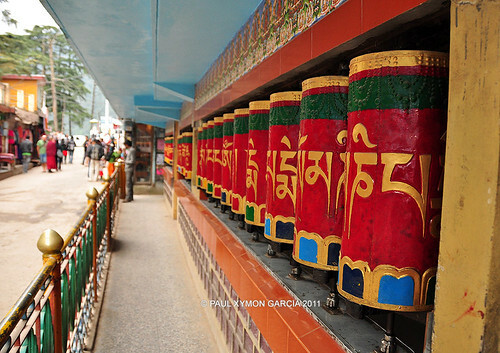 McLeod Ganj is now the base of the Tibetan government in exile. Seeing Tibet, represented in all the stupas, the prayer wheels, the prayer flags and the gentle Tibetan people, settled in the heart of India was good enough. But then it got better. 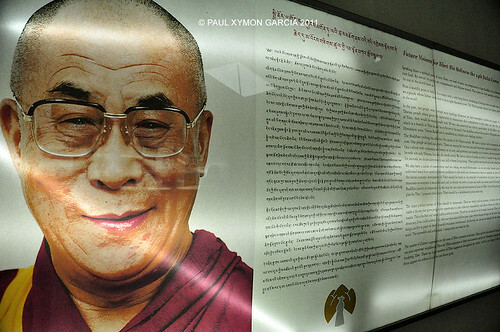 We discovered through dalailama.com (yes, it’s an official website) that His Holiness, the Fourteenth Dalai Lama, was not traveling the world as he usually does, but rather was staying here for a few days. He was giving a lecture at the request of Buddhist pilgrims from Korea, and it was open to the public. So we saw the Dalai Lama, like Michael Palin did. His encounter was a one-on-one interview, sure, but ours was good enough. The best part was, none of it was planned. After spending a few days in Dharamsala, we knew we had to come down the mountain again. I personally did not want to do another 14-hour bus ride back to the Indian capital, New Delhi. So we figured we stop by another non-Hindu city in India. 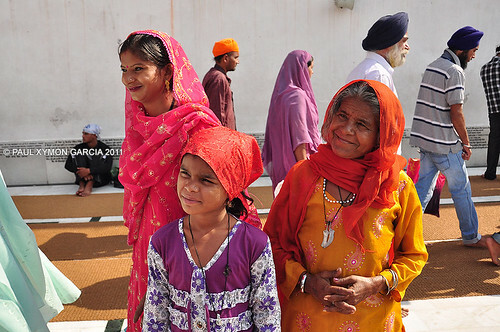 This time, it was a Sikh city—the holy city of Amritsar in Punjab province, bordering Pakistan. We only realized it in hindsight that Michael Palin also passed through this place. In fact, he entered India from Pakistan through the Lahore-Amritsar border crossing at Wagah. The funny thing about the Wagah border crossing was that every evening, the Pakistan Rangers and the Indian Border Security Force participate in a mutual, very aggressive and quite bizarre, border-closing ceremony. A bit of arm-flailing, feet stomping and you have yourself a veritable display of friendly yet chauvinistic pomp and pageantry for the entire world to see. Go ahead, google it. You’ll see. You didn’t think that we’d get ourselves to this part of the world and not see the highest of the highest of them, did you? 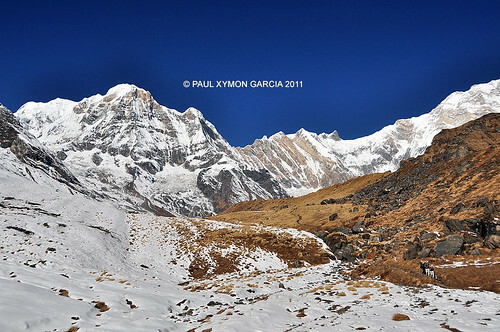 Part of our original itinerary was to go to Nepal and trek to the base camp of the highest mountain in the world. 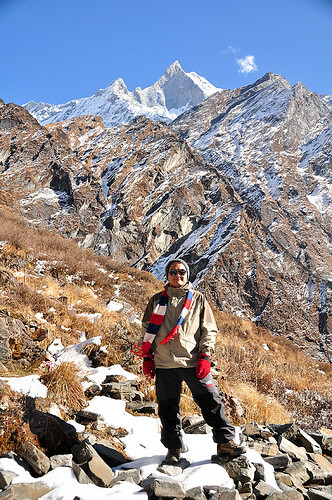 The trek to the Everest Base Camp (EBC) is a 14-day arduous undertaking to altitudes above 5,000 meters above sea level. It’s hard on the knees, and at those oxygen-deprived heights, on the heart and lungs. Why we wanted to do that? I’m not sure. But to begin the task, we needed to fly to the jump-off point for the trek, Lukla, whose airport is notorious for its unpredictable weather. So once again, the travel gods had other plans. We waited eight hours to board the plane, but weather never cleared so we never got off the ground. Flight was cancelled that day, and the next. At this point, we knew we had to trek someplace else. So from EBC, we were now doing ABC—Annapurna Base Camp, so called the Annapurna Sanctuary Trek because at the base camp, you get a 360-degree view of nothing but the snowy peaks of the high Himalayas, an amphitheater of white mountains. We reached the sanctuary, worse for wear and enjoyed every single minute of the experience. And yes, you guessed it. Michael Palin also did this trek. It’s really funny how things worked out the way they did. You make all your plans and you obsess about them, then due to things beyond your control, they change the last minute. So what’s next in Michael Palin’s itinerary? There’s Tibet, Bhutan, Assam and Bangladesh, but I’m not going to any of those places, at least, not yet. I’m going to Yunnan in Southwest China, where Michael Palin also went. Unless the travel gods have other more amazing plans, in which case, sign me up! Paul Xymon Garcia is a typical twenty-something Filipino born and bred in the big chaotic capital of Manila, Philippines. Having discovered his linguistic abilities post-college, he became a language professional, creating materials for ESL students and mastering the Spanish language along the way. Now, he is a Spanish translator who does writing and photography gigs on the side as he embarks on the biggest adventure of his life. If you can't get enough of his stories, follow his adventures on Walk Fly Pinoy. this is one of my fave documentaries! i did a marathon on this!